If you ever got into web games, odds are that you have heard of and likely spent many hours or days already having played the Drag Racing series. For those unfamiliar with the game the idea was simple, you bought a virtual car, then raced it to win money and points to get upgrades, and you tried to have the best and fastest car possible. 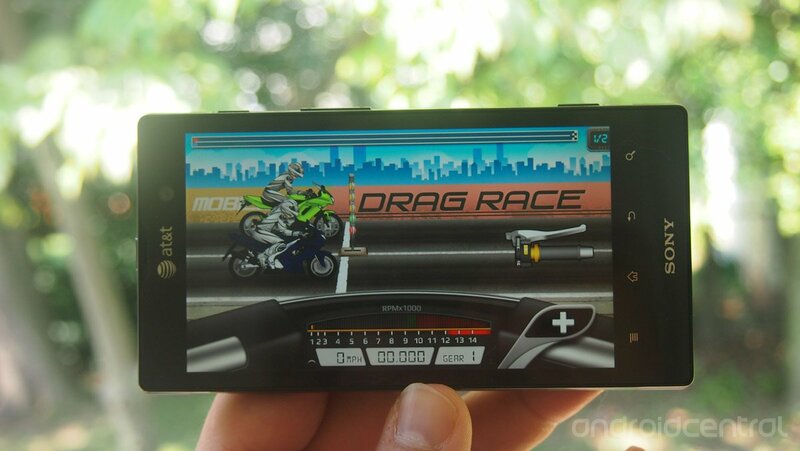 These games have since evolved, and been brought to the mobile space, and they have made a spin off, Drag Racing - Bike Edition. As you could imagine from the title this game is very similar, except with the use of motorcycles instead of cars. Let's hit the break and see exactly what the game is all about! When you first start the game off you are given a bare-bones, basic bike to race with, and you need to earn money to perform upgrades to the bike in order to continue competing. Once the game loads you are able to race, shop, go to the garage, or back to the lounge, it will also show you how much money you have earned, and how many trophies you've taken home so far. Clicking the race option will allow you to race in a quick race, enter career mode, get some training or race verse other opponents online. Depending on your comfort of the game play, training is a great place to start, and then a few quick races prior to heading into the career mode. Once you enter the career mode there is a series of races, each race you win you are awarded a dollar amount as well as a set number of trophies for that particular race. In addition to winning races, bonus money is awarded for perfect launches off the line, as well as perfect shifts throughout the race, so you will certainly want to try your hardest on each race. The further into the career you get, the harder the opponents become so you will need to take some of the money earned and head into the garage to upgrade your bike to continue to compete. Clicking on the shop button will take you to buy a new bike, and heading into the garage will allow you to perform upgrades on the bike you currently own. These upgrades include engine, exhaust, turbo, gearbox and other updates as well as the ability to perform cosmetic changes such as paint color and wheels on the bike. Each upgrade will cost a certain dollar amount, and the higher end upgrades also require a certain amount of trophies to be purchased. Once you upgrade the bike you will want to tune it as well to ensure all the new parts are performing at their top level, and then continuing the career will become much easier. While the game is quite simple in concept, the more you play and unlock and upgrade bikes, it quickly becomes addictive, and you will find yourself wanting to play more and more. One of the great features of the game is that you don't have to race an entire career for it to save, it saves your progress after each race, so whether you have five minutes or two hours to kill, this game is sure to be a crowd pleaser for many. Hit the break for a couple more game play screen shots, and be sure to try it out for yourself today!